Cleveland Clinic researchers have designed a potential new class of drugs that may reduce cardiovascular risk by targeting a specific microbial pathway in the gut. Unlike antibiotics, which non-specifically kill gut bacteria and can lead to adverse side effects and resistance, the new class of compounds prevents microbes from making a harmful molecule linked to heart disease without killing the microbes, which are part of the gut flora and may be beneficial to overall health. In the study, which took place in mice, the new drugs reversed two major risk factors for cardiovascular disease—increased platelet responsiveness and excessive clot formation—by lowering levels of TMAO (trimethylamine N-oxide), a gut bacteria byproduct that forms during digestion. The research was published in the September issue of Nature Medicine and was led by Stanley Hazen, MD, PhD. High levels of TMAO in the blood have been shown to be a powerful tool for predicting future heart attack, stroke and death risks, according to previous research initially spearheaded by Dr. Hazen and his team, and subsequently replicated around the world. TMAO testing is now in clinical use as a result. In several landmark studies in the last five years, Dr. Hazen's team was the first to demonstrate that the metabolite TMAO is produced when gut bacteria digest choline, lechithin and carnitine, nutrients that are abundant in animal products such as red meat and liver. Choline is also abundant in egg yolk and high-fat dairy products. Dr. Hazen's group went on to show that TMAO affects platelet reactivity and thrombosis (clotting) potential, which lead to a higher risk of myocardial infarction (heart attack) and stroke. In this new study, Dr. Hazen's group demonstrated that a new series of inhibitors, called mechanism-based inhibitors, potently interrupt the gut microbial pathway that produces TMAO. Because the compounds are structurally similar to choline (called analogues), the bacterial cells are "tricked" into taking them up as nutrients. Once transported into the microbe, the inhibitors then block the production of TMAO by inactivating a specific gut microbe enzyme called cutC (choline utilization protein C). The group found that a single oral dose of one of the potent inhibitors in animal models significantly reduced TMAO levels in the blood for up to three days and reversed both enhanced platelet responsiveness and heightened thrombus (clot) formation following arterial injury. Once taken, the drugs were minimally absorbed into the body, and instead stayed in the gut where they targeted just the microbial pathway. The drugs also reduced "hyperresponsive" platelet function to normal, inhibiting excessive blood clot formation but with very little risk for increased bleeding, which is a common side effect of other anti-platelet therapies. In addition, the drugs were designed to not kill the bacterial cells and, therefore, likely do not contribute to antibiotic resistance. 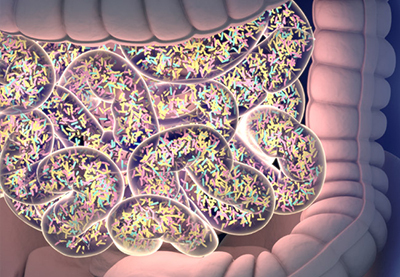 Dr. Hazen directs the Cleveland Clinic Center for Microbiome and Human Health. He also chairs the Department of Cellular and Molecular Medicine in Cleveland Clinic's Lerner Research Institute and is co-section head of Preventive Cardiology & Cardiac Rehabilitation in the Miller Heart & Vascular Institute. Co-first authors on the paper were Adam Roberts, PhD, Jennifer Buffa, MS, and Xiaodong Gu, PhD, all of the Department of Cellular and Molecular Medicine. Investigators from Procter & Gamble participated in some of the studies reported. Dr. Hazen is named as co-inventor on pending and issued patents held by the Cleveland Clinic relating to cardiovascular diagnostics and therapeutics, having the right to receive royalty payment for inventions or discoveries related to cardiovascular diagnostics or therapeutics. Dr. Hazen also reports having been paid as a consultant for P&G, and receiving research funds from P&G. This research was supported by grants from the National Institutes of Health and the Office of Dietary Supplements. Read the full press release in the Cleveland Clinic Newsroom (video).